Computers just aren't selling like they used to, and many critics, analysts, and longtime Windows users point the blame finger at one culprit in particular: Windows 8. Nobody’s using Windows 8, they say. It’s worse than New Coke, they say. PC shipments are cratering and it's all Windows 8's fault, they say. Last Tuesday, Microsoft countered the doom-and-gloom by announcing that it has sold 100 million Windows 8 licenses to date. That rate puts the company’s newest OS on par with Windows 7 at the same point in its lifecycle, and Windows 7 is the most widely used PC operating system in the world. But if global PC shipments are in free fall—IDC called the 14 percent drop in the first quarter the steepest single-quarter decline ever—how can Microsoft keep selling licenses like it’s the good ol’ days of Windows 7? Simple: What's good for Microsoft isn't necessarily good for the PC industry as a whole. To a certain degree Microsoft is insulated from a suffering PC market, says Patrick Moorhead, founder and principal analyst at Moor Insights and Strategy. The company not only sells licenses to PC makers, but also sells so-called site licenses directly to large enterprises with a huge user base, bypassing device manufacturers altogether. Microsoft also sells a smaller number of licenses directly to consumers through Windows 8 upgrades for PCs running XP, Vista, and Windows 7. Stephen Baker, vice president of industry analysis at market research firm NPD, offers another possibility. “The actual process of OEMs buying licenses is fairly opaque,” Baker said in an e-mail to PCWorld. “But one explanation could be that securing a certain amount of licenses qualifies an OEM for favorable pricing.” So PC makers might also be “warehousing” their licenses to lower the overall cost of PC production later on. Wherever those 100 million licenses are going, the real number of Windows 8 PCs in use is believed to be very small. Last Thursday, Moorhead released estimates suggesting that 41 percent of all Windows 8 licenses sold are not actively being used. Recent numbers from StatCounter, which measures OS market share by counting Internet users, backed up that discouraging report. Windows 8 accounted for less than four percent of global PC usage between January and March, the firm reports in its most recent estimates. At the same point in its lifecycle, Windows accounted for nearly 11 percent of all PCs in use—nearly three times better than Windows 8's usage. 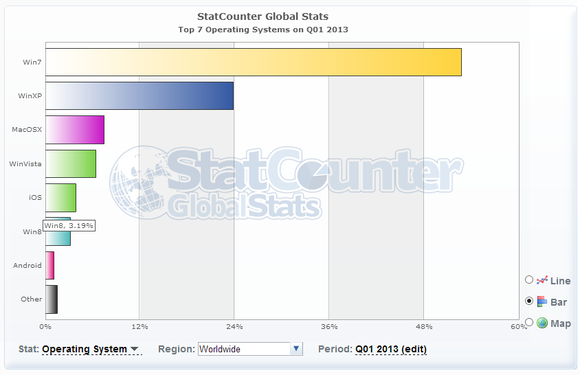 That light blue bar represents Windows 8's usage, according to StatCounter's Q1 2013 stats. Finally, Windows 8's app attach rate—or the average number of apps per license—also suggests Windows 8 isn't performing so well in the wild. In the same blog post where Microsoft announced breaking the 100 million threshold, the company also said that 250 million Windows Store apps have been downloaded. That's just 2.5 apps per license, which is far behind the curve set by Android and iOS, whose users rock an average of 32 and 41 apps, respectively, according to data released by Nielsen in 2012. Comparing app store downloads isn't a direct corollary to overall usage, but it highlights Windows 8's struggle for mainstream appeal, 100 million licenses and all. Windows 7 all over again? But sagging shipments and usage percentages only tell half the story. When you look at the hard number of PC units shipped, manufacturers produced between 76 or 79 million units between January and March, depending which analyst estimate you're reading. Netbooks. What were we all thinking? “Given the fact that there were strong netbook shipments which drove the overall growth [in 2010] along with strong consumer notebook sales, I would say that the 1Q 2013 results indicated that the PC market was very weak and in declining trends,” Gartner principal research analyst Mikako Kitagawa told PCWorld via e-mail. The hot-selling item of each era greatly impacts the respective totals. Yep, the old "Are tablets PCs?" question rears its head again, and it's an apt one, as tablets are in many ways the successor to netbooks. Like fruits and vegetables, Moorhead says, PCs have a limited shelf life. Prices can be slashed in a matter of months if cheaper components roll out. Aging PCs sitting in the retail pipeline risk becoming outdated as new technologies get released, reducing the price even further. As a result, PCs have to be sold at a generous clip to keep the industry running smoothly. Microsoft's Surface Pro shatters convention for the industry, not just for the tablet form factor. Here's the rub: The PC market is anything but running smoothly these days—especially as Microsoft continues to remake itself as a devices-and-services company. Microsoft’s new Surface lineup accounted for nearly half of all Windows 8 and Windows RT tablets sold between January and March, according to IDC. At the same time that Microsoft is taking half the (admittedly small) Windows tablet market, Moorhead believes consumers are deferring the purchase of a new PC and buying Android and iOS touch devices instead. The end result is confusion and worry from traditional Windows device makers, who are now dealing with a shrinking market and competition from their primary software supplier. There are Windows alternatives waiting in the wings. 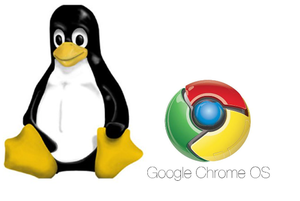 It’s no coincidence that while Microsoft is experimenting with making its own devices, device makers are experimenting with non-Microsoft operating systems such as Google’s Web-centric Chrome OS and Ubuntu Linux. PCs running alternative operating systems aren't huge sellers, however, meaning at some point manufacturers will have to figure out how to better sell Windows 8, whether it comes loaded on a PC, a tablet, or some sort of innovative FrankenHybrid. Microsoft will release the much-anticipated Windows 8.1 (a.k.a. Windows Blue) refresh later in 2013. The company is also reportedly relieving the cost burden for device makers by cutting the licensing price of Windows 8 for small-screen devices, like the sub 10-inch tablets recently touted by Asus and Acer. In addition, Intel will release new Atom and Core processors expected to make Windows 8 devices leaner, longer-lasting, and more powerful. Will the coming round of Windows 8 device and software improvements be able to spur a new round of growth for Windows-based PCs and tablets? Right now, it’s anybody’s guess—but let's hope so, because the numbers clearly show that the PC industry can suffer even while Microsoft thrives.